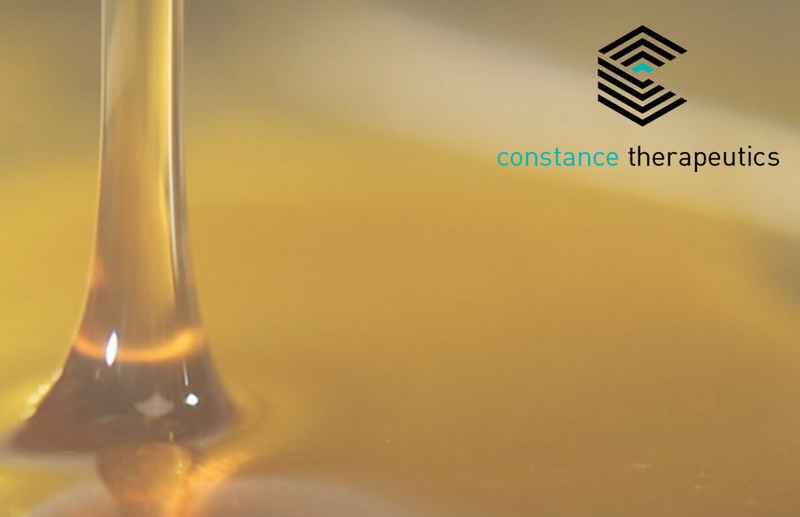 Constance Therapeutics’ standardized medicinal cannabis extracts, previously available only to qualified patients undergoing Constance Therapeutics’ protocols and patient support programs, are derived from fully trimmed flowers of female plants with known genetics using certified organic, pharmaceutical-grade ethanol. I tried all five blends — flavorful, rich-hued oils infused with a viscosity-reducing agent and essential oils to enhance inhalation and increase bioavailability of cannabinoids. Each performed as billed. Boost, a high-THC sativa with peppermint essential oil and Vitamin E, heightened energy and creativity without any jolts or spikes. Relax, a high-THC indica with lemon and lavender essential oils and Vitamin E, made me feel relaxed and sleepy. Pure, a sativa-indica hybrid, provided the most pleasant overall experience of all blends — a mellow, even high. Calm, a 2:1 CBD:THC formula with Vitamin E, took the edge off of too much coffee. Focus, a high-CBD formula with peppermint essential oil, cleared my head and re-set my focus when I woke up groggy after too many midnight tokes. The hybrid oil tasted the cleanest of all the extracts, which, while dark, toasty and rich do not taste overly concentrated, harsh or intense. Essential oils are added to increase the bioavailability of cannabinoids. They also act like flavor enhancers, pairing with similar essences contained in the terpenes of each strain. Each half-gram cartridge contains 189-210 mg of either THC or CBD, except for the 2:1 CBD:THC blend, which tests at 140 mg CBD and 70 mg THC per half-gram cartridge. Double the numbers for 1-gram cartridges. Jupiter’s disposable Liquid 9 cartridges feature magnetic bases that snap securely in place and remove easily. There’s no chance of unscrewing the tops from the permanently sealed tamper-proof cartridges and no chance of spilling the oil inside. Cartridge mouthpieces are color-coded to make it easy to keep track of multiple cartridges containing different strains, blends and cannabinoid ratios. Cartridges stayed clean and leak-free. Oil never touched my lips. Constance Therapeutics packages its Jupiter Liquid 9 cartridges in squat plastic vials with screw-on caps that protect cartridges against damage and leaks when they’re not inserted into pens. I evaluated the half-gram cartridges. Product notes say each half-gram cartridge is good for at least 90 draws. (One-gram cartridges are good for 200 draws.) I admit I lost count or stopped counting on occasion and some of my draws were intentionally shortened to less than half a dose, but that number feels right and I never doubted the value of each extract or its volume. Jupiter’s vape pen is about the size and weight of most handheld blood-monitoring and insulin-injection devices. Its magnesium alloy material is sturdy and stylish. Its brushed-metal nonagon design is sleek and comfortable. Its long-life battery, built-in mini-USB charger (no adapter to lose!) and ability to operate while charging are brilliant. The battery endured a couple of days heavy use before recharging quickly. There are no buttons to push or program. The pen’s breath-activated ceramic core technology begins heating the oil inside cartridges as soon as you start inhaling. The pen operates at a consistent temperature without burning the oil. I vaped my way through five half-gram cartridges; not a single inhalation tasted overly toasty. Pens are designed to deliver individual doses in 10-second increments. Pens vibrate as you inhale and pulse to signal the end of each draw. Ten-second draws are generous — causing me to burst into coughing fits a few times due to the volume of vapor I vigorously inhaled. Shorter and smaller draws are doable. Three-second draws (counted out “One Mississippi, two Mississippi, three Mississippi” as I inhaled) provided quick, sufficient hits. You’ll easily find your comfort zone with a few puffs. Superior quality, uniquely formulated whole-plant cannabis oil extracts in a variety range of strains, ratios and blends. Measured doses and consistent effects. High-quality, high-end vape pen is user-friendly, durable and handsome. Easy-in, easy-out magnetic cartridges and balanced nonagon design are great for elderly people and others with compromised or limited dexterity. There are no buttons to push or program. Ceramic heating technology performs optimally and consistently. Long-life battery and a built-in charger are leaps and bounds ahead of competitors. Constance Therapeutics’ whole-plant cannabis oil extracts and Jupiter Research’s vapor-on-demand pens are available for purchase by qualified medicinal cannabis patients at Octavia Wellness, a dispensary in San Francisco. Check Constance Therapeutics’ website for updated locations. Vape pens, including case and mini-USB charger cord, are $40. Other companies licensing Jupiter Research’s vapor-on-demand pen and cartridge technologies include Flight Farms, a High Times Cannabis Cup-winning producer in Los Angeles; Indigo Pro, an adult-use brand in Colorado and Washington; and medicinal cannabis dispensaries in Rhode Island, Massachusetts and Delaware. Ed Murrieta, a journalist who covers consumer and lifestyle trends for leading cannabis media, is a paid content consultant for Constance Therapeutics.